Vancouver from about 1905 – a world in which people moved about on feet, bicycle, horse, and, since 1887, in electric streetcars. And all shared the same space. Actually, a photo of any city street in North America prior to 1915 reveals a kind of slow-motion anarchy. There were no centrelines, pavement markings, traffic signals or even stop signs. Here’s one from Washington, D.C.
Pedestrians crossed streets where they wanted, when they wanted. Business took place in the street. Children even played in the streets. Into this mix came the automobile: a new form of transportation incompatible with old uses. As Peter Norton argues in his book “Fighting Traffic,” the automobile arrived as an intruder, and brought with it blood, grief and anger. So great was the carnage that mothers would place small memorials in the street where their children died. 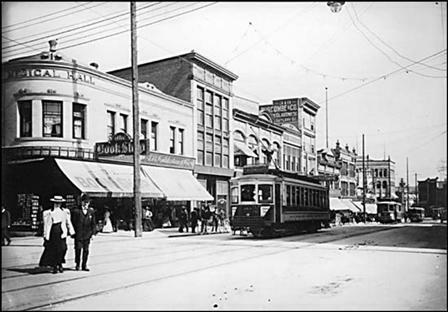 Downtown businesses were concerned about congestion, as were engineers who thought it unfair when streetcars crammed with passengers were impeded by vehicles with only a single driver. An alliance of automotive interests united to counteract the constraints on automobiles proposed by city councils, engineers, street railways and safety reformers. Made up of automobile clubs, dealerships and manufacturers, they were known as Motordom: a non-pejorative term for advocates of the Motor Age. And their singular accomplishment, as Norton describes it, was a revolutionary change in the perception of the street. Motordom successfully redefined the roadway as a place primarily for cars. have to go to an assigned place and walk between the lines – the crosswalk – or wait for a signal before proceeding. Children, for their safety, could no longer play in the street. Motordom was also successful at redefining the street as a free market, in which it was unfair to discriminate against a minority of users. The solution, as Motordom argued it, was not to favour one mode over another but to let consumer choice prevail. order to avoid the congestion created by the car. In Los Angeles, for instance, the Major Traffic Street Plan of 1924 led to the widening of arterial roads in a crosstown grid. Little attention or money was paid to the transit system. Vancouver in 1928 undertook a similar treatment authored by planner Harland Bartholomew (who had helped with the Los Angeles plan) and which became the basis for street improvements through to the 1980s. The success achieved by the expenditure of many millions on public works was short-lived: increasing the traffic capacity of major roads eventually made the existing problem worse. Wider streets initially eased congestion but they also encouraged more residents to leave public transportation for their automobiles, leading to more congestion. The Depression and the War, however, took the pressure off. Meanwhile, engineers consolidated what they learned into their transportation handbooks, beginning in 1942. Newly emerging post-war municipalities incorporated these road standards and the accompanying parking requirements into their bylaws. Urban regions would be designed not just to accommodate the car and truck but to be designed for and ultimately dependent on them. All other transportation choices – transit, bicycle, foot – were secondary if not impractical. In 1956, Americans undertook the single biggest engineering project in history – the Interstate freeway system. The system – over 40,000 miles criss-crossing a continent – was largely built out in two decades. Towns and cities hardly knew what hit them. At the time, mostly good things seemed to happen. Suburbia was the fulfillment of an American (and Canadian) Dream built on insured mortgages, technically magnificent infrastructure for water and roads, cheap land and even cheaper energy. The lifestyle made possible was broadly shared, optimistic, ebullient. free parking for every use, meant that Motordom had succeeded beyond its expectations: the urban region was designed not just to accommodate the car but to be designed solely for the car – and the truck and the bus. So pervasive would vehicle-dependent design become that people rarely saw any alternative. Our lives were so organized around car-based mobility that no other option was seen as realistic. Motordom is now the world of auto-dependent urban planning. And we, like fish in water, live in the world of Motordom. Granville Street downtown is like those streets years ago. Hopefully, the city will end up keeping it that way. I have a question concerning the streets in Vancouver highlighted in your 1928 Harland Bartholomew map. Isn’t this the same grid of streets that UBC Prof Patrick Condon celebrates as the bones of the streetcar city?